Figure 6.1. The share of forest land area by forest ownership category, 2010. Finnish forestry is mainly in the hands of families, and the properties are mainly quite small. Private forest owners own 12 million hectares of forest land; the State, 5 million hectares; companies 2 million hectares; and others (municipalities, parishes and other public corporations) own 1 million hectares of forest land. In private forests, the number of forest property entities32 of over 2 hectares is about 375,000, and the total number of owners of these entities, including the stakeholders of estates and partnerships, is almost 737,000. Some 74% of private forests are family-owned. The average size of a forest property entity is 30 hectares. The average size has not changed in recent years, but the size distribution has changed so that the number of both small (less than 10 hectares) and large (over 200 hectares) properties has increased. Two kinds of structural changes take place in forest ownership: changes amongst owner groups and internal changes within a group. Changes amongst owner groups have been very small, and have generally involved the purchase of holdings. Some forests change hands through the exchange of land or, in the acquisition of conservation areas, also by expropriation by the government. Changes within a group of forest owners mainly happen in the private forestry sector. The most characteristic features are the slow pace of change of forest property ownership and the aging of the forest owners – the average age of forest owners is 60 years, and pensioners are the largest single group of forest owners. Regional differences in the structure of forest ownership are high. The share of State-owned forests increases towards the north and east, whereas private ownership is more common in the southern parts of the country. For this reason, the importance of private forests in terms of roundwood production is higher than might be concluded from their share of the total area. Moreover, a higher share of State forests are protected. 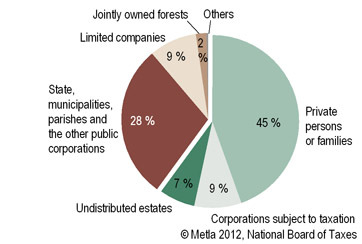 32 The number of forest property entities includes forest properties owned by the same forest owner across the country.